Imagine being the only two seventeen year olds in a small town. That’s life for Kirby Arrow, named after the most dissenting judge in Australia’s history and her best friend Clancy Lee, would be musical star. Clancy wants nothing more than to leave town and head for the big smoke, but Kirby is worried, her family has a history of leaving. She hasn’t heard from her father since he left when she was a baby. Shouldn’t she stay to help her mother with the goat’s milk soap making business, look after her grandfather who suffers from dementia, be an apprentice carpenter to old Mr Pool? And how could she leave her pet goat, Stanley, her dog Maude, and her cat Marianne? Seventeen year old Kirby Arrow is one of two adolescents in the small country town of Alberton and has no inclination of departing. In their small ramshackle house, Kirby cares for her grandfather while her mother runs a small business from home. Kirby is a kind and compassionate young woman and devoted to caring for her grandfather who has been diagnosed with dementia, portrayed wonderfully with tenderness. Her mother is a stern woman who is insistent that Kirby experience the world beyond Alberton and her novice carpentry apprenticeship. I cherished Kirby's relationship with the absurdly fabulous Clancy. Clancy is Chinese Australian in a predominately Caucasian town and an only child to parents who own a local family restaurant. Clancy is flamboyant with Broadway aspirations, waiting until he finishes his schooling to travel the well worn path to Sydney. Leaving Kirby behind. Although both Kirby and Clancy were raised in Alberton, Clancy yearns to connect with other adolescents who share a similar heritage. I appreciated Clancy initiating the conversation of inclusiveness, as it allowed Kirby to understand his perspective. The new restaurateurs daughter is an exquisite and free spirited young woman, relocating to Alberton from New Zealand. Clancy is enamoured by Iris and devises an elaborate scheme to earn her affections. An amateur youth theatre group. I loved the tentative romance between Kirby and Iris, although Kirby attempts to resist the attraction and places her in quite the predicament. An impeccable example of fluid sexuality as orientation is never discussed. The diversity of characters were wonderfully portrayed. Clancy is Chinese Australian and Iris is a biracial. Indian decent and formerly living in New Zealand. The narrative touches on socioeconomic, sexuality, mental illness and a neurological impairment as Kirby's grandfather is diagnosed with Dementia. Night Swimming is absolutely glorious! A charismatic, delightful and amusing narrative of a small country town, falling in love and immense dreams. Categorically enchanting and captivating until the final page. It is absolutely magnificent Lauren, brilliantly written and the sense of friendship and family was incredibly lovely. I hadn't noticed that before Casey. We have such a large New Zealand born population and I can't recall having seen many if any New Zealand born characters in Australian young adult. Night Swimming is absolutely superb. I'd go as far as to say it's been one of my favourite contemporaries I've had the pleasure of reading. Period. And the diversity isn't used to further the narrative either Verushka, is simply is. That's just another aspect I love about Aussie authors, they're wonderful at representing all aspects of our multicultural communities. Night Swimming is absolutely brilliant Verushka, I'd love to see what you think of it. I saw you talking about this on Instagram. It sounds lovely. It's spectacular Karen, so spirited and beautifully written. This sounds so good. There is something so delightful about reading small town life through the words of an Aussie author. I've read and cherished quite a few! I also love the cast of characters, the diversity you mentioned, and the wonderful quirkiness of the everyone and everything involved. Australian fiction and in particular young adult, is just so wonderful Joy. You're an honourary Aussie. It's magnificent Ailyn, such a breath of fresh air. I love these characters already :-) I keep reading all the reviews that are popping up on bloglovin and dying a little more inside because I’m restlessly eager to read this beauty. But who am I kidding I really enjoy reading reviews – connecting to other book lovers, feeling a part of a something and all that. #LoveOzYA all the way :-). I feel like I spend so much time doing the same. I'd have much more reading time if I got off the laptop and actually read. But you damn bloggers make it so bloody hard. Everyone, take a week off blogging so I can catch up. I recently read and loved this book so so so much! It was so cute and well written and I loved how it was set in outback Australia which is such a new sitting! Lovely review as per usual Kelly! It was wonderful wasn't it. I love young adult set in regional towns and this is by far one of the loveliest I've read thus far. I absolutely adored it. Thrilled you enjoyed it too Anisha. It's not fully explored as the main focus is on Kirby's narrative, but both Iris and Clancey's parents are present, which in itself is a rarity in young adult. It's such a gentle and lovely read. HOW GOOD IS IT THOUGHHHHHH. Actually I'm meeting Steph Bowe this weekend because she's in Sydney and we have a mutual writing partner and I'm so excited. I'll have to try not to fangirl too much. I'm so excited for you! That's amazing! Make sure you tell her how much we all love Night Swimming and casually ask what she's working on now. 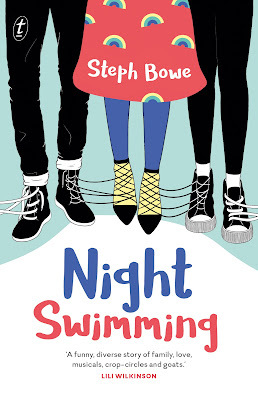 Steph Bowe is such a young talented writer. I love how her books are never about an easy insta love, but the characters take time to explore themselves and slowly develop their friendships with each other. It's just very pleasant to read. She's phenomenal. I loved every aspect, from small town Australia, to our diverse communities, first love and dapper goats. It was beautiful. I can't wait to read her other titles. Wow I am so excited to read this! Great review Kelly! Also, I am super excited because yay for diversity, and I am Indian, so always love to read some rep! I think you'll adore this one Prabhleen, it's so wonderfully written and incredibly charming. Would love to see what you think of it! I can't wait to pick this up, I'm heading to the launch tonight and I'm going to grab myself a copy and maybe even read it on the way home. I just love contemporaries set in Aus and haven't read a YA that features Dementia that I can remember, I know there's been some when it's mentioned or that character works at an aged care facility but I don't think it's been one of the main themes in the book. Thanks Casey. And isn't it strange that with so many Kiwis living in Australia especially, they are more represented in Australian young adult. I love small town Australia and Night Swimming is absolutely brilliant!